For many years, Netflix has reigned supreme as the top video subscription service. But now a challenger has appeared to stake their claim for that title: Amazon Prime Video. Estimates in early 2016 put the number of Netflix subscribers at around 47 million, while Amazon now has 54 million Prime members. Even though many of those members don't use the video services included with their membership, Amazon continues to build its Prime Video offerings. They've started providing original movies and shows of their own, and recently created a "Prime Video" monthly subscription option for $8.99 per month, for customers who want to try their video services without committing to $99 a year. If you're a member of Amazon Prime, but haven't really used the Prime Instant Video service yet, definitely take the time to check out what's available. The offerings change from time to time, but just like Netflix, Amazon's catalog includes plenty of awesome movies. To help you out, we've compiled a list of some of the top "hidden gems" on Amazon Prime Video as of September 2016. We've included recent films that flew under the radar, as well as some older classics that you may not have seen yet. Be sure to add them to your watchlist! This hilarious movie from the '50s is probably one of our favorite screwball comedies from Hollywood's golden age. The premise—an "elixir of youth" created in a lab accidentally makes its way into the company water cooler—is not particularly believable, but that doesn't take away from the hilarity that ensues. Monkey Business stars Cary Grant, Ginger Rogers, and Charles Coburn, and also features Marilyn Monroe as a sultry secretary. Monroe's scenes with Cary Grant are particularly memorable, and the entire cast's antics will have your sides splitting. A definite must-watch. Tora! Tora! Tora! is a careful recreation of the events surrounding the attack on Pearl Harbor in 1941. It faithfully depicts the leadup, attack, and aftermath from both American and Japanese perspectives. The directors took extreme pains to ensure the authenticity of the picture, and it shows. They didn't cast any big stars to help keep audiences immersed in the film, and Minoru Genda—the man who largely planned the attack on Pearl Harbor—was a technical advisor on the movie. Even though Tora! was not particularly successful at the box office, it became a hit in Japan, and home movie sales and rentals made it a financial success. The plot is slow-moving at times—which can be expected of a historical drama—but the stunning action sequences more than make up for that. If you're a history or military buff, Tora! Tora! Tora! should be at the top of your queue. Before Making a Murderer's premiere, only two other crime dramas had captured the attention of the nation the same way: Errol Morris' The Thin Blue Line in 1988, and 1996's Paradise Lost: The Child Murders at Robin Hood Hills. If you love true crime dramas, then don't miss your chance to watch this documentary about one of the most notorious multiple killings in recent history. This documentary chronicles the tale of the "West Memphis Three"—three teenagers tried and convicted for the murders of three boys in West Memphis, Arkansas. It's a chilling look at the brutal murders, and the problems with the prosecution's case against the teens—who were later exonerated and released under an Alford deal in 2011. We love crime dramas, and perhaps one of the most critically-acclaimed of all time is now on Amazon Prime. Monster tells the tale of Aileen Wuornos, a serial killer who was convicted and executed for of murdering six men in the '80s and '90s. Wuornos was portrayed by Charlize Theron, who won an amazing 17 awards for her role as the former prostitute. Theron's transformation for the role renders her nearly unrecognizable, and the harrowing plot is full of suspense for audiences who have not seen the film (or heard of Wuornos). Both Theron and Christina Ricci, who portrayed Wuornos' girlfriend, earned critical acclaim for their acting in Monster, with Roger Ebert hailing Theron for giving "one of the greatest performances in the history of the cinema." We definitely agree, and suggest you add Monster to your watchlist soon. Directed by Greg Mottola (who brought us Superbad), Adventureland stars Jesse Eisenberg, Kristen Stewart, Ryan Reynolds, Kristen Wiig, Bill Hader, Martin Starr, and Margarita Levieva as a ensemble of workers at a run-down amusement park in Pennsylvania. Adventureland provides more of the same irreverent comedy that we loved in Superbad, with a nostalgic vibe. While Kristen Stewart has been saddled with a dubious acting reputation following her roles in the Twilight films, she does a commendable job here—even receiving High Times "Stonette of the Year" award for her work in the role. At times touching and sweet, at others uproariously funny, Adventureland is a great summer coming-of-age flick that definitely earns its place in our list. With racial tension currently at the forefront of American minds, the well-timed Dear White People takes a satirical look at the racial divide. Critic Justin Chang hailed the film for "having bothered to ask some of the hard questions without pretending to know any of the answers," which is a great description. Dear White People doesn't focus on one particular race or issue, but takes a magnifying glass to the entire concept of implicit bias as a whole—with humor and grace. As director Justin Simien explains, "My film isn't about 'white racism' or racism at all. My film is about identity. It's about the difference between how the mass culture responds to a person because of their race and who that person understands themselves to truly be. All explored through the microcosm of a success-oriented Ivy League college." That microcosm—the fictional Winchester University—succeeds in providing a realistic backdrop for the witty and edgy ensemble of characters to push boundaries and deal with the fallout. In this critically acclaimed historical drama, Selma takes us on a journey to 1965, as Dr. Martin Luther King, James Bevel, and other voting rights activists lead protesters on a 54-mile-long march from Selma to Montgomery, Alabama. By highlighting racial injustice with these marches—some of which were televised as troopers beat and attacked the protesters—the disenfranchisement of black voters finally came to an end after the passage of the Voting Rights Act later that year. Selma doesn't pull any punches, and dramatically depicts the brutalization and killing of activists. While Selma director Ava DuVernay came under fire for her inaccurate depiction of the relationship between President Lyndon B. Johnson and Dr. King, it should be remembered that Selma is not a documentary, but a dramatization—and a damn good one at that. In Under the Skin, Scarlett Johansson delivers a spellbinding performance as a mysterious alien who preys on men in Scotland. The movie takes on the alien's perspective of our world, and she exhibits callous disinterest in the things that make the human experience unique—the urge to comfort a crying baby, savoring the flavor of food, or the simple enjoyment of music. While Under the Skin does suffer from lack of a cohesive plot, the moody and suspenseful story will leave you feeling both sympathetic and terrified when you stop to consider the nature of Johansson's character. Even though the director doesn't spell out the purpose of Under the Skin for you, that's part of the magnetic draw of this film—by showing the audience our world from an alien perspective, it makes the point clear that the meaning of everything really is in the eye of the beholder. We like Kurt Russell. We love horror films. We really love Tombstone. So when a director makes a genre-bending western horror film starring Kurt Russell as a hard-nosed lawman who has to defeat a clan of cannibals, it's pretty much guaranteed that we're going to lose our minds over it. Bone Tomahawk is just as awesome as it sounds, with Russell starring as Sheriff Franklin Hunt, who must figure out how to defeat the cannibals holed up in the "Valley of Starving Men" before they can murder more of the citizens of the small town he's sworn to defend. The writers and Russell leave the suspense on a slow burn, gradually building towards several climatic bloody moments which will leave you aghast—perhaps because of how suddenly they happen. While some may not enjoy the mashup of genres, we think Bone Tomahawk is a perfect choice for western and horror buffs alike. If you love science fiction films about robots or artificial intelligence, but hate their constantly rehashed plots, Ex Machina is the remedy you've been searching for. This independent movie takes common science fiction tropes and turns them upside down, as computer programmer Caleb accepts an invitation to administer the Turing intelligence test to a humanoid robot named Ava. What follows is an intricate plot with elements of sci-fi, horror, psychological drama, and thrills to keep you entertained and engaged through numerous unexpected twists. 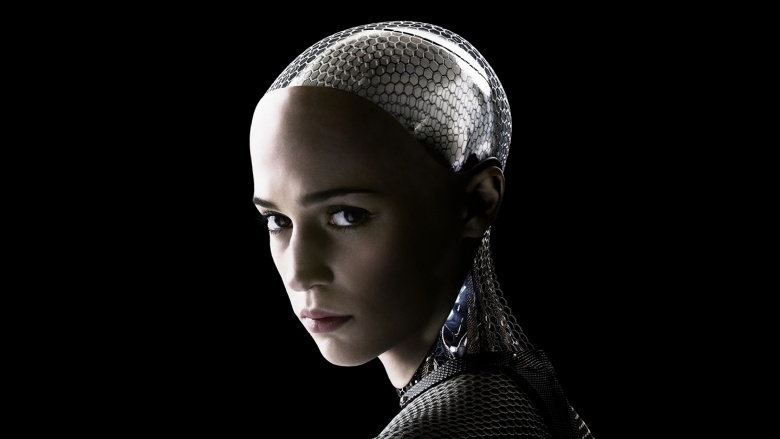 With exceptional writing and a stellar performance by Alicia Vikander as Ava, Ex Machina will keep you at the edge of your seat.